The folks over at Mamoworld have again created a very simplified tool to create some very complex and artistic animations. Squash and Stretch is their latest FREE tool aimed at bringing handcrafted easing, squashing, overshooting animations to your projects with a click of a button. The animations are handcrafted and keyframed by animators, which are intelligently applied to your own layers. The tool allows you to fine tune how much distorting ‘squash/stretch’ you want, the energy/velocity of the animation, as well as the rotation and orientation of the animation. Oh, and it comes with 100 free soundfxs which can automatically be synced to the animation using the tool. Squash and Stretch comes with several free presets for zooms, transitions, and bounces. 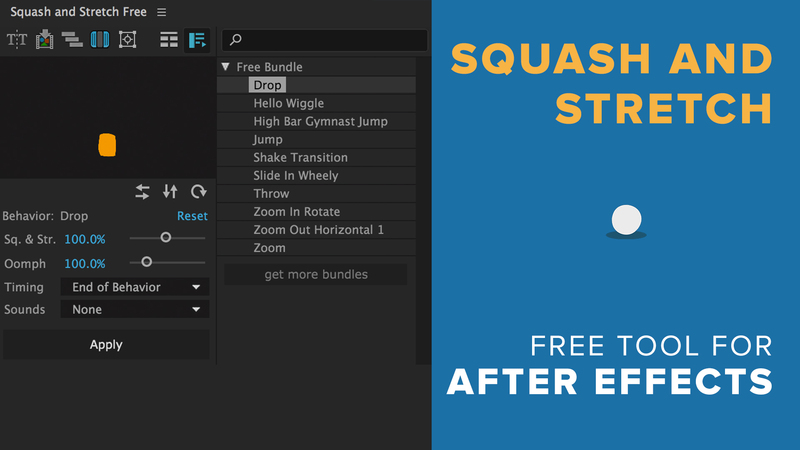 More presets and sfxs can be added by purchasing Squash and Stretch Pro or their expansion bundles. Additional, the tool comes with a few other features that may be useful outside of the squashing and stretching world, most notably a feature to auto-precompose layers AND trim them to fit the layer content size (very useful for shapes/masks). There’s also a cool staggering tool that can help you stagger layers based on in and out points, etc. Overall, Squash and Stretch is a very useful tool for adding that extra “oomph” to your animations quickly, while still retaining creative freedom and control. No more messing around with inorganic, inflexible expressions to achieve robotic easing and squashing. With a starting price of free, there’s no reason why you shouldn’t try Squash and Stretch. As always, Mamoworld continues to simplify cgi for us designers, and we thank them for it.